We surveyed our members to find out what they like about our competitions and where we could improve them and people asked us to consider introducing sections to make our competitions fairer. Back in January we introduced Open and Restricted sections to our Introductory, Preliminary and Novice classes. The Open section is for riders who consistently score high percentages with Dressage Anywhere: 70% at Intro, 68% at Prelim and 66% at Novice. Once a horse and rider combination achieves these five times or more with Dressage Anywhere, they'll be automatically moved to the Open section. If a horse and rider is experienced and used to scoring high at other competitions, they can choose to compete in the Open section. 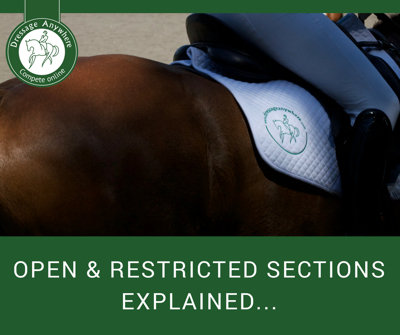 The Restricted section is for those fairly new on their dressage journey and enables them to compete more fairly with similar horse and rider combinations. Our rosettes are awarded by section and prizes are awarded to overall placed riders in each class. If you have any other questions about sections, get in touch and we'll do our best to help.